Wings West Airlines Flight 628, a commuter flight, departed Los Angeles for San Francisco, with scheduled en route stops at Santa Maria and San Luis Obispo. At 11:10, Flight 628 left the gate at San Luis Obispo. The weather at the time was essentially clear and the visibility was 15 miles. At 11:16, after taking off from runway 29, Flight 628 called the Los Angeles ARTCC and reported that it was climbing through 2,700 feet 'IFR to San Francisco.' At 11:17:23, the Los Angeles ARTCC’s radar controller cleared Flight 628 to the San Francisco airport, as filed, to climb and maintain 7,000 feet. At 11:17:38 the aircraft collided head-on with Rockwell Commander N112SM at 3,400 feet. This single-engined aircraft had departed Paso Robles Airport on a training flight with two pilots on board. Nll2SM was flying in visual meteorological conditions and under VFR in the vicinity of the San Luis Obispo Airport just before the collision. 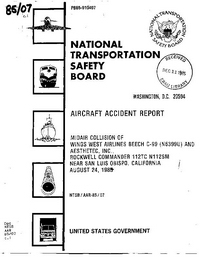 PROBABLE CAUSE: "The failure of the pilots of both aircraft to follow the recommended communications and traffic advisory practices for uncontrolled airports contained in the Airman’s Information Manual to alert each other to their presence and to enhance the controller’s ability to provide timely traffic advisories. required its pilots to tune one radio to the company frequency at all times." Distance from San Luis Obispo-County Airport, CA to San Francisco International Airport, CA as the crow flies is 305 km (191 miles).